How much would it cost to re-write the #Myki software to make it fast as other cities’ smartcards? Refactoring is a legitimate strategy in software development. It’s where you feel the design is (more-or-less) right, but the software implementation has gone wrong, and needs to be completely cleaned-up, by chucking it out and re-writing it. So here’s a thought: if the single most annoying, unreliable, sluggish part of the Myki system is the Readers, then how much time, money and effort would it take to completely refactor all of the software in the Readers? Don’t change the hardware and cards, which has cost a bomb to buy and install, but (assuming the protocols the Readers work with is okay, and the hardware/cards are up to scratch – they’re used in other cities, after all) upgrade the software. As my friend Josh often says: How hard could it be? I would love to be part of that team! the problem isn’t a programming one. It’s cultural. The people in charge of myki give us the system they think we deserve. Myki topup machines still give simultaneous message: “Insert card” “Remove card” when paying by credit card. Why has no one at myki fixed this after three years? 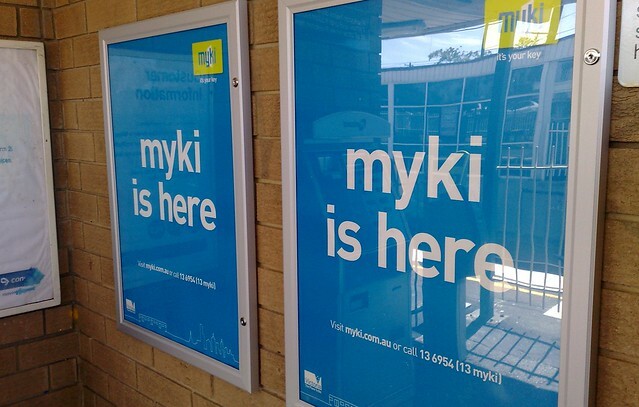 Because no one at myki cares. At the qualifying final I put my phone in the ticket reader and the turnstile opened, using whichever of the Passbook and Ticketek apps which took my fancy. Being a builder more than a fixer, I’d rather we invested in designing the next iteration, starting with axing and adding a few presumptions that would improve overall operation, e.g. confining ticketed-only access to on-vehicle dispensing with platform access barriers while extending accessible off-vehicle validators to busy tram and bus stops; instituting a rewards system for likes of short trip use on outer ends and less popular routes; allowing users to go into credit at least comparable to Etag; giving mobile device users instant access to fare calculations and ability to report inconsistencies. Unless they’ve screwed up the hardware design as much as the software design (embedded and server-side), I’d say it’s totally doable. They seem to have addressed performance and reliability a reasonable amount just with software changes. I’d guess there’s plenty of scope, but obviously if there is a reason the reading has to be slow (the case design for example meaning RF transmission isn’t as efficient as it should be) then perhaps it’s time for v2.0 hardware. It does seem like they’ve given up on it though (it’s “good enough”), but it’s hard to tell really. There should probably be some sort of public inquiry into it, but I suppose this government doesn’t want to set a precedent of accountability. Allow Payweave and PayPlus to pay (not just Myki cards). They use the same protocol. It solves the tourist problem, solves the no money on card problem. Daniel Bowen, now an international expert. Congratulations. It wasn’t until I was in London recently that I realised how slow Myki is compared with Oyster. There I was, standing at the reader, waiting for the system to respond as I do in Melbourne, when I realised the Oyster card had been read almost instantaneously and the people behind me couldn’t understand why I was blocking them! Look at supermarket software. If there is a special on 2 bottles of Powerade, you just scan 2 bottles and it automatically gives you a discount! Myki should be the same. It should automatically give you the appropriate discount if you touch-on 5 days in a row. No more hassles of buying a monthly pass or an yearly pass. Go Perth ! i still hod the faint hope that one day soon one liberal government (ours in Vic) will be happy to learn from another ! Sorry Daniel, re-reading it, comment 6. above looks a bit weird or narky. I was actually congratulating you for being quoted in “The Guardian” on Wednesday.